Creative Consultants are a team of talented young people (aged 18-29) who deliver workshops in communities and with businesses. They come from diverse backgrounds and have a range of creative skills. They meet regularly to train and collaborate together, to learn from industry professionals and one another, and to get support as they establish themselves as successful creative professionals. There are three levels of Creative Consultants; Supporting Creatives, Primary Creatives and Consultants. We will work with you to make sure you are working at a level that suits you, and help you to develop your skills as you progress. Creative Consultants are offered wrap-around professional development and support, including practical skills-based learning, 1-2-1 career coaching and paid employment as creative workshop facilitators. There is no charge to become a Creative Consultant – all training and support is free of charge. This program is based on a model in the UK that supported 93% of participants into a successful and sustainable career within creative industries, so if you are looking to make a go of it, this is for you. How to become a Creative Consultant? What is your current creative practice and how have you used it when working with others? What would you like to further learn / develop as a workshop facilitator at this stage? Why is this important to you? What do you understand the term ‘professional behaviour’ to mean? (Give as many examples as you can). You can answer those questions by filling in an online form below, or by submitting a video via the online form. If your application is successful you will be invited to attend a recruitment workshop as the final stage of the assessment process. 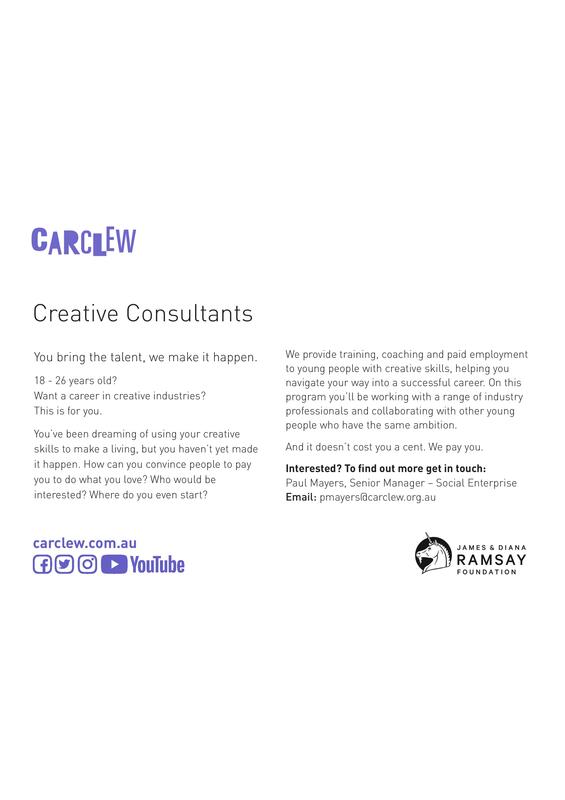 During that workshop you will learn a little more about the deal between Carclew and the Creative Consultants, and we will learn a little more about you. Then if you’re happy and we’re happy, you join the team. If you’re keen to become one of our inaugural Creative Consultants, please complete and submit your expression of interest (EOI) by midnight, Sunday 25 November. All EOIs will be reviewed during the week commencing Monday 26 November and shortlisted applicants advised. Please note that shortlisted applicants will be invited to attend a recruitment workshop on Monday 3 December 5:30-8:30pm in Adelaide CBD. In order to be considered, you must be available to attend this workshop.